Night shots with cool venue lighting are becoming easier to do for the skilled wedding photographer than ever before. Good equipment requires skill to utilize to its fullest, but the results can be stellar. With one Canon 600 EX-RT on camera, one to camera left lighting the couple from the side and one to camera right lighting the waterfall behind, combined with the 5D mkIII's ability to capture images at high ISOs, we got a great image that just a few years ago would have been impossible. 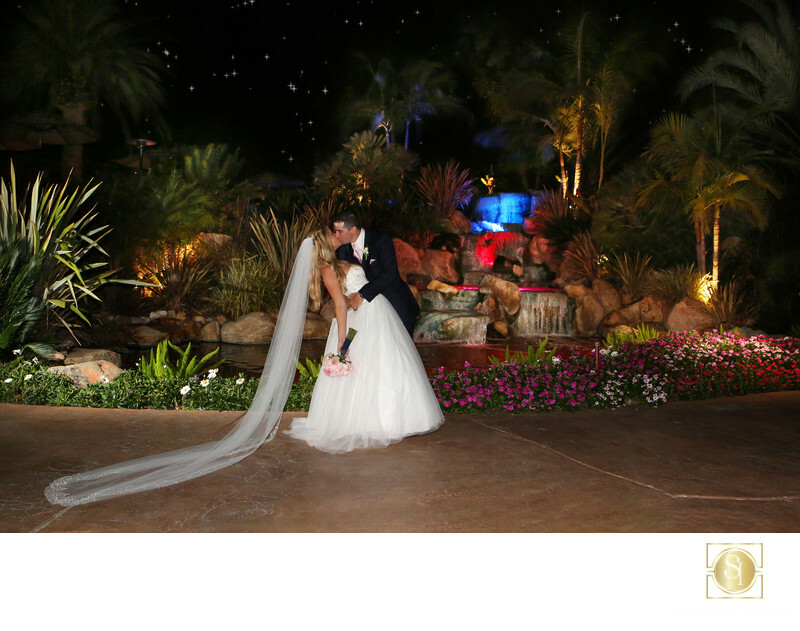 This image was taken at the Grand Tradition Wedding Estate in Fallbrook, Ca, in their Compass Garden. We'd never utilized the waterfall at night, only during the day, so we were surprised at the colors in the water. That's a bonus!